While waiting in the line for Murray's steak sandwich at Target Field tonight , Steve Marsh ran into 2009 Mrs. Minnesota Heather Hall. Steve snapped a photo of Hall posing with an adorable little girl and some dude who's face expression we absolutely love. 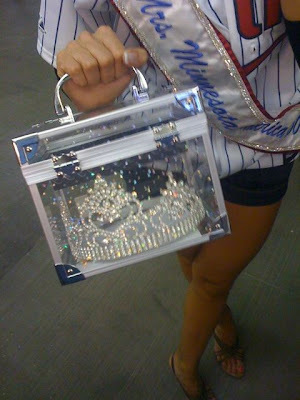 Here is another pic Steve took: this is a clear case that Hall uses to carry her crown.